I paused. I swear I only went down to get something so quickly, I come back up and he’s signed up for Thursday Surgery Special? How long was I gone for?? I wouldn’t just let him go for it without me knowing what it is first so I asked to see the doctor again. The doctor smiled knowingly as I came in through his door. Ah, wives and girlfriends, the kancheong ones. “Ok, let me explain this to your wife this time…” the doctor ever so patiently started to draw stuff to me. I don’t really get it but basically he’s got to take some bad stuff out and he’s got to straighten something that was crooked. I looked at him and studied his face. Ah this didn’t sit well with me. On one hand, I want him to not feel the pain during the surgery. On the other hand, I want him to be fully awake and not “sleeping”. We’ve all heard those horror stories of people not waking up after being put under, haven’t we? That ain’t happening today, NA-AH DOCTOR?! “Your husband is going to be fine, don’t worry.” he said in the end, probably after hearing my mind speak to him silently. A couple hours later, I found myself walking with Mak along the hospital hallway on the way to the Operation Theatre. Fadza was being wheeled in front of me and I had a huge lump in my throat. No, watermelon. Huge watermelon-sized lump in my throat. He knew I was nervous and I didn’t want that to make him nervous so I smiled cheerfully and squeezed his feet. He smiled back, with such calm in his eyes. I could feel tears coming but I held back not wanting him to see that I was scared. Mak gave him a kiss and I squeezed his legs before he went in. I wanted Mak to have him to herself. I mean, hello, if this was Daniel and Daniel’s wife kept hogging him, I’d push her aside and tell her to beat it. Mom > wife. So I stepped back. I gave him a big smile as the sliding doors opened for him. As the doors were closing, I totally lost my cool. “Nurse, don’t give too much of that GA thing ok?!! Nanti overdose bahaya!” I called out to them. Did that nurse just roll her eyes at me?! The moment the sliding doors closed, the words Operation Theatre stared at me. And I just burst out crying. All the fear that I kept inside just burst out and I was sobbing. Mak saw me cry and she sobbed too. 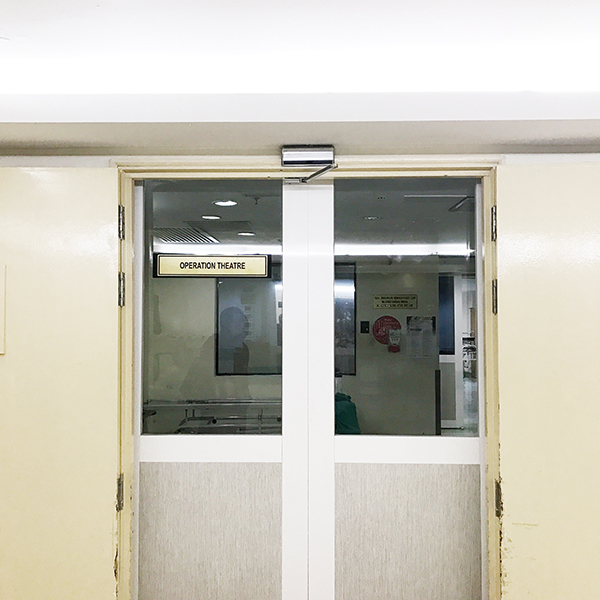 Both us sobbing women went into the elevator to go up, then realised we wanted to get snacks downstairs so we went down (the hospital kerepek bawang is legit, I got three packs), then went back upstairs, still sobbing. I immediately took out the prayer mat and started praying. In my mind, Fadza was all alone in the room with strangers not having his loved one by his side, and now they were probably preparing to inject him with the GA, and he must be feeling so nervous but trying to be strong. And I just bawled thinking about him. I was sobbing while praying and I kept having to wipe my tears. My doa that Asar prayer was literally just “Please God, please please please let Fadza wake up later, please please please pretty please.” God was all I had. I can’t describe the feeling I had this evening, the feeling of having your husband’s life in another human being’s skill. 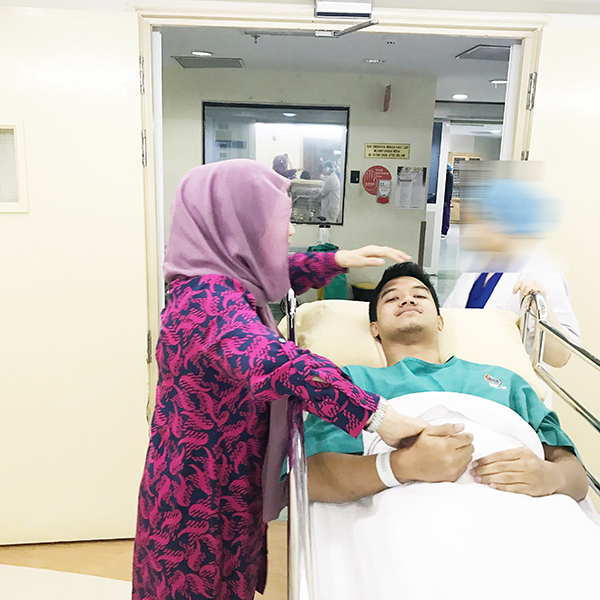 So many what-ifs came to mind – what if he doesn’t wake up, what if the nurse gave wrong medication, what if the doctor got tired halfway and collapsed, what if they run out of kerepek bawang downstairs should I get another one, what if I didn’t tell Fadza enough that I love him? WHATEVER OK. You may have a point, but the fear is there nonetheless ok?! I looked at his hospital bed, all empty. I missed him. I missed him so much. I can just picture his smile, his kind smile, his loving smile. What if I no longer get to see that smile? I remember the warmth of his arms hugging me tight. What if I no longer get to feel that warmth? I cried some more next to his empty bed. Is it weird if I lie on the hospital bed and smell his pillow until he comes back? Ok ok, I draw the line there – that’s weird, Vivy, you shouldn’t do that. For the next 3 hours, I tried to keep myself busy but I swear it felt like the clock wasn’t moving fast enough. It’s like 3 years have passed and the clock hand just moved a cm to play tricks on you. The hospital room door opened and I jumped. That’s him, he’s back!!!! “Saya nak hantar makanan ye, cik,” a lady came in to send in a tray. POTONG STIM, MAN. I DON’T WANT FOOD, LADY! I WANT MY HUSBAND. But ooh chicken rice. This place is fancyyyy. You can put it over there, I’ll eat it later, thank you kind lady. He’s awake. He’s conscious. Alhamdulillah. I kissed him and even groggy, he smiled at me. He was very weak but he searched for my hand and intertwined my fingers with his. God, I love this guy so much, swollen and all. This really is love and thank You, Allah for answering my prayers just now. My husband is back! I’m writing this as he sleeps now, snoring because he’s got wires and cotton pads up his nostrils, but just tonight, his snoring is like beautiful music to my ears. P/S: Drugs are so powerful, man. He says yes to everything. So far, I’ve gotten a handbag, a spa session, a holiday with my girlfriends… gonna try for a pony later. This so reminds me of the day my fiance died, exactly two months before our wedding date. I woke up at 9am that day, coz I slept so late the night before. Had a huge fight with him over the phone, couldn’t remember what was it about. But I woke up to see so many missed calls from an unknown number. So I called back, and the person over the phone carefully told me what happened. I still remember vividly his word. “Ya saya..” I answered. I felt so nervous. I couldn’t feel a thing, I remembered feeling like vomiting, I was speechless, it was cold, I feel so blue, and I cried so hard.. His word broke me.. He continued describing the whole situation, and I was quiet the whole time, unable to think or say anything.. .
Urghhhgg pakcikkk! Why didn’t you start with that!!!! Oh, we are happily married and we have one beautiful daughter. “I’ve gotten a handbag, a spa session, a holiday with my girlfriends… gonna try for a pony later” …habislah Fadza. when i saw the photo even before I clicked Read More, i knew it’s going to be a sobby post. true enough, terkelip kelip mata taknak jadik neng yatimah in the office. almost getting in the mood nak bersedih kesian kat you but your writing .. sorry i just laughed 🙃 funny is your middle name eh? Almost crying. Like reading a John Green novel. GWS Fadza. Hehe dont worry vivy, i’ve been under GA for 5times now and alhamdulillah God says its not my time yet. Hahahaha. I understand how did you feel but the story line is too dramatic. It tickles my heart. I wish one day I will taste this kind of love Too. Fadza gonna be fine! Get well soon! Too funny! 🤣 Get well soon, fadza! Feels like a snippet of Sophie Kinsella’s book! Hahaha alhamdullilah, praying for a speedy recovery! What are the odds that Fadza and I both had impromptu surgeries yesterday! On a serious note. Get well soon Fadza!! 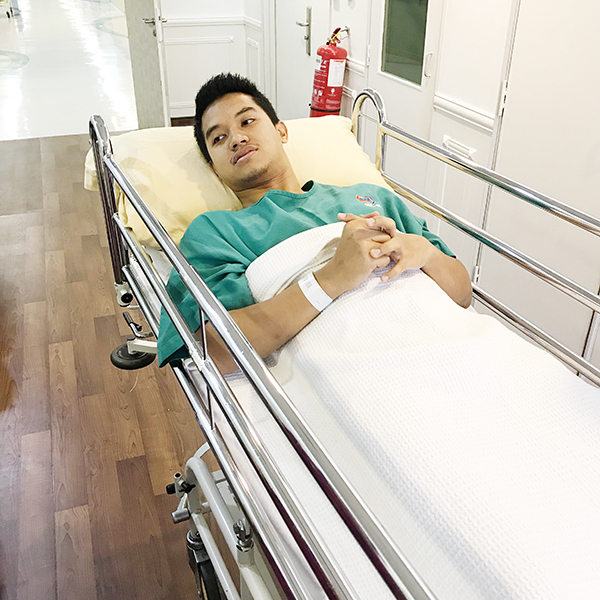 Tell Fadza get well soon, okay? Be strong Vivy! Ahhh…I’m guessing he’s had his sinus surgery…. Get well soon Fadza & Vivy, hang in there! i went for a surgery a few years back and i was the one who cried nonstop when i gained conciousness 😅 i was like ‘i’m aliveeee..nurses were confused as hell lol.. I swear my eyes was wet & feeling sebak but the Nasi Ayam part gor me gigle & the last part… WIN!!! You should be actress Vivy. You just lit my day..
of course even it is a just a minor surgery but the GA complications were there. Hahaha shouldnt be laughing but tht read was entertaining. Get well soon Fadza and “this too, shall pass” Vivy. This reminded me to my husband’s tonsillectomy one year back. Being in medical field made me less fear and less worry knowing that the procedure is not major and should be finish in 2-3hours max. And you what, as i was busy handling my twins at home i just realized the operation had been gone for more than 4hours and i hadnt heard anything from my husband. Later i received a phone call from my husband’s doctor telling me that my husband was pushed to the ICU. I was like whatttttt?! U gotta be kidding me. Unfortunately due to some technical ‘errors’ he lost lots of blood and being transfused with 2pints of blood. Just to share with you, i totally understand why you are being all drama about this lol but trust me, even a simple procedure also has its own complications. Just my bad, i was acting all cool before my husband operation. I should be more paranoid after this perhaps lol. Hi Vivy! It sound so weird to see myself drop a comment here. Hahaha. anyway, i’ve been following your blog since the day i knew you. i just love to see how you handling your life especially between your family and your career. Everything written here makes me picture how does my future little family. Please don’t stop being cute, Vivy! I’m pretty sure Mariam is more or less alike you. I shall say that you are my role model. Keep inspiring me, can’t wait to read more and more. he’s got to take some bad stuff out and he’s got to straighten something that was crooked , lolol. Omg I love you Vivy!!!!!! i burst to tears once reading your story Vivy. I have came across the same situation when my husband diagnosed with dengue fever. only Allah knows how it felt. Every night crying and praying to Allah so that he will return to home from hospital. Every day i sent him Sup Ketam. that a very real test for a wife… Stay sound and safe with Fadza. May Allah always bless a happy couple.